The legendary sci-fi shooter is back! Jump into the action as Hawk gets aboard his ship, the Hunting Dog, and heads out toward the enemy. Blast through stages while effectively using all three of the weapons at your disposal and receiving support from ally Wild Cat ships. Switch through equippable power-up options on the fly to change the direction of your attack. You'll have to blast in front of and behind you to survive all seven stages. Hard-core shooting-game fans looking for a challenge can select HARD or DEVIL mode to experience even more intense action! very very good shooter. right up there with blazing lazers, the star soldier bunch, and r-type. I'm glad they're bringing in the cd and super cd games. these games will show people who didn't get the turbo/duo back iu nthe day what they were missing, and also what the duo could have done to the market had they marketed it better/had better prices. alos, just wait for the sequel, Lords of Thunder. That game is mind blowing, especially the music. I can't wait to play all of the old games again. 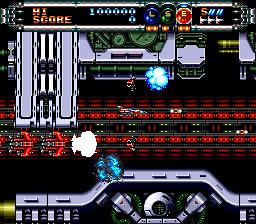 I can remember back in the day, I found it hard to believe that the TG-16 could run a shooter that could compete with the likes of Thunder Force III or Gaiares. But not only did Gate of Thunder take them on, it stomped them in the dirt! 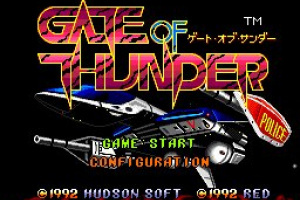 Out of all of the 16-bit shooters, Gate of Thunder is only topped by its own sequel, Lords of Thunder! Gate of Thunder is one of the best shooters - period. For any system. I prefer it to Lords of Thunder/Winds of Thunder any day of the week. The music will blow you away. It's important for those who don't know, that the music playing in the video clip is actual in-game music. Hudson announced that this game will come out this monday. SOLD!! I've got 800 points ready to go on monday for my first TG-16 purchase EVER! if it does, can somebody tell me if the bonus games (Bonk 1 and 2, Bomberman) of the original (cd) were included? Ha, obviously they're not going to include three free games with it, are they? I'm pretty sure GoT got an individual release later as well (Maybe not in all regions), this is probably just that version. Awesome! It's downloaded today. If you like a shooter, don't pass it up. This game is worth posting twice about. Just wait til they bust out Y's I + II. I'll never shut up. Wow looks fun, but I wonder if like next week we will have Lords Of Thunder? OMG - I had no idea they were going to release the CD games (I hoped and prayed!) Now lets just hope that Ys will come soon! Has it the standard shooter rule (One hit and all powerups are wasted)? I'm downloading it for the music alone. So the bonus games are not included, or what? Eh, 5 stars anyway. Now to get my Wii online. do you have to restart a section when you die or do you just jump back into the action with a new ship instantaneously? Geoff - you respawn rather than restarting a section. But do you lose every item while respawning? I wouldn't say that its Lost Levels or Ninja Gaiden hard but you're not going to beat the game in one sitting. Should my brother and I prefer this over Super Metroid? That wasn't the response that I was hoping for, Daz. It doesn't matter anyway because I got Super Metroid. I'll get another Wii points card. And if I get yet another, I'll get this, along with Sin and Punishment. Downloaded this great game friday sure is good fun like the cd music.On the intro theirs part of the music that sounds like Afterburner the arcade game.Sure is hard as nails too. I heard the music was compressed for the virtual console. Is it noticeable? AWESOME! Then I'm glad CD games are making it to the VC. If you die you lose your drones, seeker missiles and whatever weapon system you had equipped at the time, though if lasers are equipped when you die they revert to lv.1 power (of 3). However any other unequipped weapons you have when you die are unaffected. I’ve so far found this to be a great, hectic game so far; hard and fair at the same time. I’ll have to spent more time with it to review it, but one thing is sure, I'm definitely going to be having fun with this one. 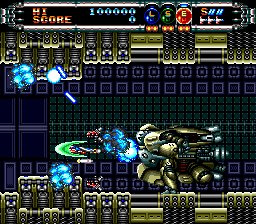 One of only two VC shooters I've actually been able to beat (the other being Super Star Soldier), and certainly my favorite horizontal shooter to date on Virtual Console--or anywhere else, for that matter, but I haven't played too many horizontal shooters. It's a bit of a shame that the sound effects completely overpower the otherwise-awesome music, but the weapon-switching mechanic makes this one very enjoyable game. It looks awesome, I'm just in awe, nothing more to say. 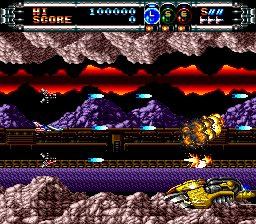 Great shooter, a lot like Thunder Force IV, I am aggravated by the low volume of the music though, the pumping arcade-like soundtrack really added a lot to this game back in the day, but you can't even hear it on the VC version, I remember it being much louder. Maybe they can release a fix for it or an updated version with louder music. Best SHMUP on the VC by a mile (To date). I have to agree with DEMON above. 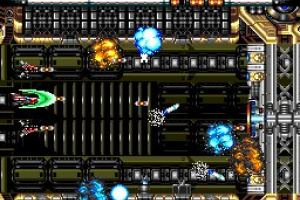 Probably the best shmup available on the VC at the moment. 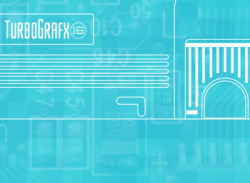 Excellent graphics and audio. Difficulty is pitched just about right too. This game is awesome and crazy and hard. I really like it! This is an incredible game. Hard as hell, but damn fun. Now let's have the Thunderforce games...and M.U.S.H.A., and Gaiares! This a great game, however there were several changes to the sound. The sound effects are louder on VC than in TGCD, and the awesome music is much quieter than the original game. I can barely hear the music, and I have to pause the game to hear it well. I hope nintendo can fix this. I don't want to buy any other CD titles until I here that this is fixed. Should I download this, even though I already have Soldier Blade? @MM - I would say so. 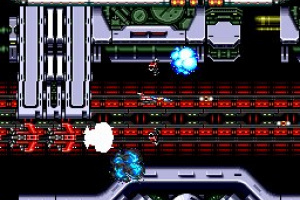 Horizontally scrolling shmups play very differently to vertically scrolling ones. Much different pace. Both are equally good games and deserve to be played by shmup fans. What do you guys say? This one or Axelay? I have to say that this looks really, really cool. I'll get to it sometime (hopefully soon). Great music yeah? I'd like to agree if I could here it.I have turn the sound right up and the sound FX are so loud my neighbours think they're under attack by Al-CIAda. One of the best ever, download now. Good game but not as good as Soldier Blade. Really solid game. The music is fantastic, controls nicely, and it adds a strategic element of what weapon to use and where it is most effective. My only complaint is the first boss is laughably easy. Currently my favorite game on the Wii. Not just VC, but the Wii. I've played this game probably every day since I downloaded it. I never had the CD attachment for my TurboGrafx (wanted it, but couldn't afford it) but this was one of the games I wanted to play. Is it really just 600 points as stated in the review? Shouldn't it be 800? Oops! It is 800, don't know what happened there! I absolutely loved Lords of Thunder so last night I finally decided to download this. The music is not as good and drowned out anyway, the controls aren't as responsive and feel too heavy, and the difficulty is high but not in a good way—I found it a lot less fair than LoT. I'll put a few more hours into it but at the moment I wish I hadn't downloaded it. Maybe I'm mad for not loving it? Who knows. As Koresh says, if you are looking at getting this game because you bought LoT, save your money. It's not near as good. Sure it may be a higher price than other TurboGrafx games available, but it was 800 points well spent. 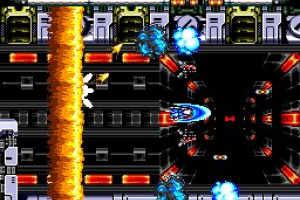 An absolutely awesome shmup. I'll make sure to get this first then. It looks pretty good to me, and it seems to be very different from Lords of Thunder, so I'll probably see it as great in it's own right. I have to ask though, what is up with the box art? ^I'm kinda wondering the same thing. This game looks pretty good, and it's got one one rockin' soundtrack, but I think I'll just get Lords of Thunder instead, since that game lets you play as a flying knight. Suh-weet! I love both Lords of Thunder and Gate of Thunder but if I could only have one, it would be Gate of Thunder. It's my all-time favorite shooter. I am pretty hard to please with the forced-scrolling shooter genre, and Gate of Thunder is awesome. Somehow I think of games like Devil May Cry or Ninja Gaiden Sigma, where the action is intense and you either feel awesome for pulling it off or like you've lost to a worthy opponent if you don't. 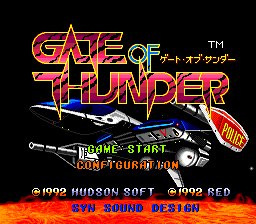 I had no idea I could enjoy a forced-scrolling shooter so much and even call it a thing of epicness until I experienced Gate of Thunder. Other shooters can feel like you're learning a dance, only really trying to figure out where in the screen you're supposed to be at what times. Gate of Thunder really isn't any different, but it's quite an elegant ship dance, with fair warning for threats and methodical placement of challenge. 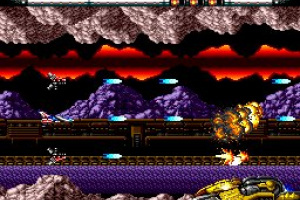 Lords of Thunder comes close, but make no mistake, Gate of Thunder represents the perfect forced-scrolling shooter. The sequel gets away with throwing out a great deal more cheap shots--unpredictable, dubious hazards--thanks to the fact that it takes more than one hit to die. Gate of Thunder's challenges just make so much sense, like one area involving an asteroid avalanche while you were already going through a narrow passageway, preventing an unlucky player from hanging around the top of the screen when it started--thank you, Hudson, for using your brains and thinking about the player's point of view this time! Lords certainly isn't worse than the average shooter in this respect, but Gate of Thunder's polish makes the game one long string of the cleverest and yet impeccably-paced scenarios in the genre. No thoughtless or arbitrary stage design here. 7 levels of absolute awesome, along with a fantastic soundtrack, that's some great techno without Lord of Thunder's rather over-the-top tendencies. 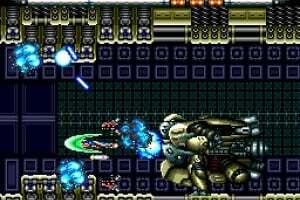 Just beat this game today easily my top vc game and shmup. I wish the soundtrack was as loud as LoT. Its hard to hear the rock background music over all the shooting and I think that's a real shame. After reading recommendations about great shooters such as Lords of Thunder and Soldier Blade I became interested in downloading this as well. However I am not convinced after watching video on YouTube with the music drowned out by the sound effects. Too bad because I really want this. Has anyone heard if there has been a downloadable patch to correct this problem yet? Not a major problem but the music rocks on Lords of Thunder and I would like to enjoy this game at its full potential. This game is completely inferior to Lords of Thunder. I've tried both, and there really is no comparison. The music in the game is drowned out sadly. Don't know if it's just me, but I can hear it after liston to it carefully after a few goes. Great game though. Thanks Slangman, I appreciate the advice! 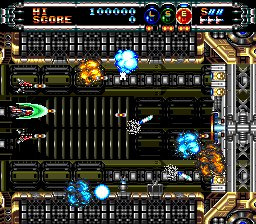 This game still looks awesome but now I'll probably just get Gradius:Rebirth instead! Okay, I finally downloaded this game after some convincing by Corbie. I am very glad I did because Gate of Thunder is AWESOME! I wish I had downloaded it sooner but at least now I have it and I'm really enjoying it! Yes, the sound effects still overpowers the music, which is a shame but I got used to it. Its a small price to pay for a shooting experience of this magnitude! 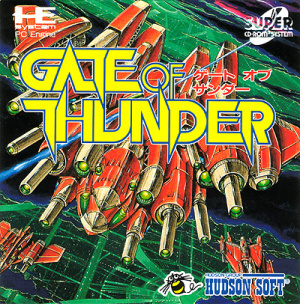 I still like Lords of Thunder better but Gate of Thunder is a very close second! 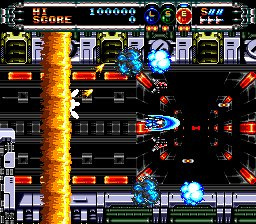 It´s a very good shump for TG-16/Turbo Duo, but I think that Gradius II: Gofer no Yabou is better. Without a doubt, one of the greatest gaming soundtracks my ears have had the pleasure to listen too. so sick! so so sick! the power ups are rad, i even use the green one and i usually hate green power ups in shooters. This is my new one quarter game after i flipped Raiden Fighter Jets, so i spend hours training on this bad boy. Great music, i just wish it was louder! After comparing videos of the VC version and the actual TG-CD version, it appears the sound effects drown out the music in the actual TG-CD version as well. I suppose I could be wrong, but even if I am the difference was not noticeable.